The top-ranked school was one of 37 Manhattan elementary schools that held demonstrations Friday against the controversial standardized tests. Schools complained the tests were poorly worded and confusing and did not test what students had learned, among other issues. Elementary schools, including P.S. 11 in Chelsea, P.S. 3 Greenwich Village and the East Side’s P.S. 59, also demanded that the tests be released to the public once they were graded, something the New York State Education Department has refused to do. Covering her gray shirt in plastic wrap, to protest the lack of transparency, P.S. 234's Principal Lisa Ripperger called on the state to release the contested exams by testing giant Pearson. "If the tests are considered as good as they are, they should be willing to put them forth, release them to the teachers, students and parents they affect," said Ripperger, after leading a half-hour march around the red brick school at 292 Greenwich St.
Parents marching with their children complained that the tests, which took three days, were a waste of time and energy for their kids and the teachers. They also criticized the confusing nature of the tests, along with a number of product placements in the questions — with references to products like Barbie and Nike throughout the exam, parents said. "These tests don't have anything to do with the Common Core [federal learning standards], with actually teaching our children something that's useful," said Giovanna Rosselli, the mother of a P.S. 234 fifth-grader and kindergartner. "And if they are going to test the kids, why not let schools see the graded exams, and understand what they are testing — it makes no sense." 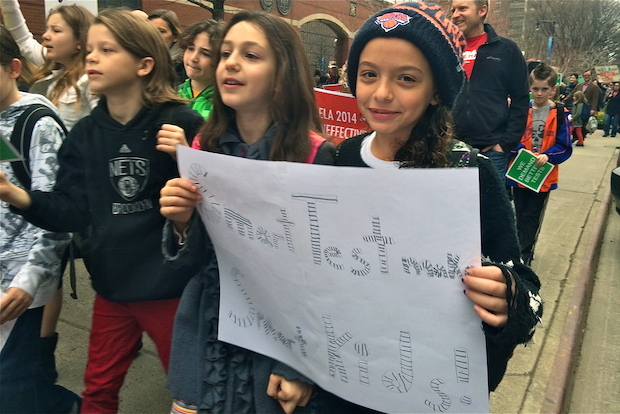 Kasha Raulph, an 8-year-old third-grader, said she thought the tests "weren't fair," after marching with her mother and classmates. "I don't think they were good — they were too hard." Last week, a protest at Park Slope's P.S. 321 drew hundreds who criticized the age-inappropriate content and poorly explained multiple-choice questions that seemed to have no one right answer. A Pearson spokeswoman previously told DNAinfo New York that the state's Education Department, not Pearson, made the decision to keep the tests confidential.